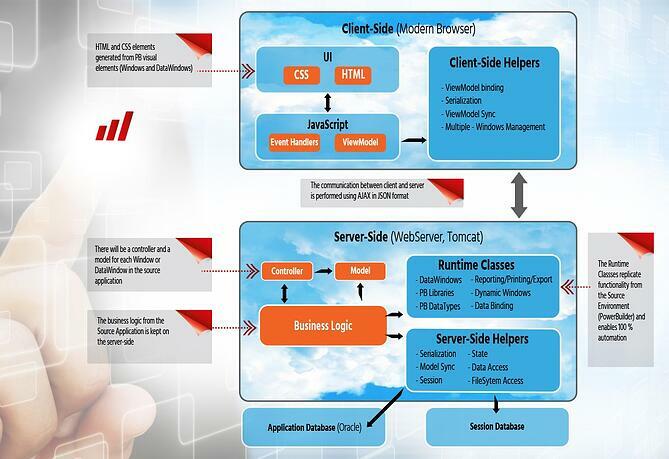 Mobilize.Net PowerBuilder to Java/HTML5 migration tool migrates PowerBuilder apps to a Web application that follows an MVC architecture using the Spring MVC framework on the server side and follows an MVVM architecture on the client side. The following diagram shows a high-level view of the proposed architecture. On the server side, the converted application has a set of Spring MVC controllers that represents each one of the windows of the original application; these controllers have endpoints to handle each one of the different interactions of the windows, and receive and return data in JSON format. Besides the controllers, on the server side the application has model objects that represent the elements of each one of the windows and are equivalent to the ViewModel objects on the client side. There is a set of Mobilize.Net libraries written in Java 1.8 that take care of the synchronization of the objects sent from the client side with the models in the server-side. They also handle logic to create instances of these elements and retrieve the necessary objects for each user’s session. The source code for these libraries is part of the migrated application. Once a request from the client side is processed by a controller on the server-side, instances of the models for the current windows are created and the control passes to the business logic layer, where the actual logic of the application is (this is the logic that comes from the event handlers and functions of the original application). This logic interacts with the model classes instead of the user interface. The models on the server side replicate the hierarchy defined in the original application. There is a set of libraries that replicates the built-in PowerBuilder functionality (things such as the binding of controls to elements in the data source, the life cycle of events of a data window and tracking of changes in specific records). Additionally, during the conversion of the application all the logic that accesses the database is moved to a new layer that uses JDBC to connect to the database and execute any existing queries. This layer exposes a method for each one of the different queries in the application and is the only set of classes with direct access to the database. As described in the previous section Target Architecture, all visual elements of the application are converted to HTML5 components that provide equivalent functionality. The application is generated as an MVC application using the Spring 4 design pattern. All these elements are part of the source code in the migrated application and won’t have any dependency on proprietary elements. You can learn more here.